If your bartending experience is limited to flipping the cap off a beer and handing it to your mate, then it’s time to get practising with the Bartender Bar Equipment Set. 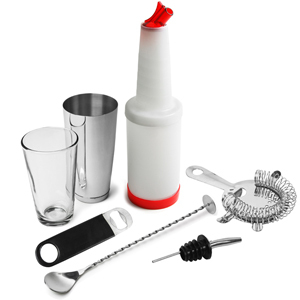 Containing all the bar tools you need to pour drinks like a professional, this set will have you serving up everything from classic cocktails to layered shots. The Professional Boston Cocktail Shaker is perfect for giving your ingredients a good shake up before serving straight into the glass with the Hawthorne Strainer. Finish off your drink by pouring juice straight from the Store & Pour or uncapping some mixers with the Bar Blade, before giving it a good mix with the Twisted Mixing Spoon. The Stainless Steel Freeflow Pourers help keep everything mess-free and allow you to experiment at layering drinks with the Twisted Mixing Spoon, which also features a flat end for crushing ingredients.